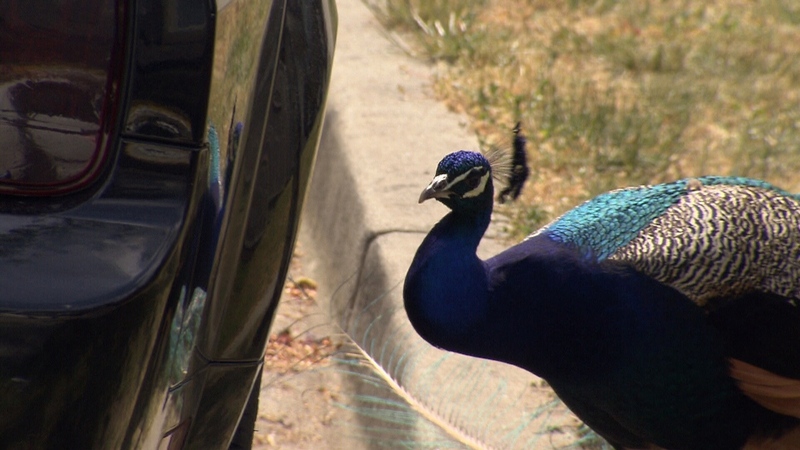 For years, some 150 feral peacocks have been the source of noise complaints, property damage and overall frustration for the residents of Surrey's Sullivan Heights neighbourhood. Now, they're in the spotlight again after some of the feathered vandals began inflicting thousands of dollars' worth of damage to pricey cars. "This peacock did this," a woman is heard saying in a video where she documents a large scratch on the side of her vehicle. The birds can be seen using their powerful beaks and talons to fight off their own reflections in the in the doors and body panels of luxury cars. "With the dark-coloured cars, they can see their reflection fairly clearly, so they mistake that as another peacock and have at it," said resident Ryan Cragg. Sometimes, he added, the peafowl won't back down for hours. "They'll get the front panel, the side panel, the rear panel and then work around to the other side." The animals have been living in Sullivan Heights for more than a decade. A resident used to farm the animals when the area was less developed. The farmer moved out and hundreds of homes were built, but the colourful birds have remained part of the neighbourhood's pecking order ever since. The peafowl most recently made headlines last month when frustrated homeowner Parm Brar illegally removed a nesting tree, landing him a $1,000 fine form local authorities. "Forty-plus peacocks were going up on my roof every night," he told CTV News at the time. The noise complaints haven't stopped since then either. "It's like living with a colicky baby from March all the way through to October," Cragg said. The peacocks mate during those months and dozens of them can be found roosting on trees and rooftops all over the neighbourhood. Sullivan Heights isn't the only place crying foul over pesky peacocks. Officials say several other North American cities have experienced similar problems. When it comes to getting rid of the birds, the City of Surrey says it is has consulted experts and issued fines to anyone feeding the animals, but its hands are tied because the Wildlife Act doesn't apply to peacocks. "They're really in this grey area where there's no clear legislative responsibility," Surrey's manager of public safety operations, Jas Rehal, told CTV. But a solution can't come soon enough for residents who've fallen victim to the colourful culprits. "This is only a peacock, not a gangster, so please come and catch them," said resident Jatinder Sigrahl. A peacock is seen in Surrey's Sullivan Heights neighbourhood on Saturday, June 2, 2018.